This is the first of our bi-monthly newsletters, aimed at keeping you up with latest news and events around the Last Ocean campaign. We hope you’re still passionate about protecting the last intact open-ocean ecosystem on earth. We certainly are, our campaign is gearing up and we are pleased to have you on board! In this newsletter you can read all about our new website, recent Last Ocean events, news from the Ross Sea, and meet some of our team. We are on Facebook and Twitter now too. Please take time to check out our new website, www.lastocean.co.nz.The site will act as the cornerstone of our campaign and offers a clear and concise overview of the issues surrounding the Ross Sea. It was officially launched on March 16 at Logan Brown Restaurant, in Wellington. The website includes a number of interviews with key scientists and campaigners as well as an up to date list of scientific and media related publications. Most importantly you can "Take Action" by signing our petition or writing to key Ministers involved (within New Zealand). There is place to donate and as this campaign relies on solely donation they are much appreciated and will be put to good use. The website is constructed by Christchurch company Red Paris, who are supporting the Last Ocean Trust by donating a third of the income from any new website build that they receive through enquiries from our site. At the launch Last Ocean Trust founder Peter Young gave a short presentation about the threats facing the Ross Sea and what the Trust is hoping to achieve. Watch excerpts from his talk in this short video. Logan Brown Restaurant was the perfect venue for the Last Ocean website launch. Our relationship with them is well established – for several years they have been donating $2 from every responsibly-caught seafood dish to the Trust. I spent the summer moving around among penguin colonies on Ross Island: capes Crozier and Royds, with a short visit to Cape Bird. 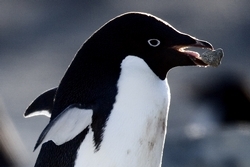 We’re investigating why, in general, Adelie penguin numbers have been increasing in the Ross Sea. Is it better reproductive success, immigration, enhanced juvenile survival, enhanced adult survival, or something else? The summer season in the vicinity of Ross Island was memorable. I think mainly due to the windy conditions, the sea ice broke completely out of McMurdo Sound to its normal minimum, at least normal to what usually happened before the B15 iceberg. This iceberg was lodged across the mouth of McMurdo Sound from 2001 to 2005 and had allowed the sea ice to seriously thicken during those years. Thus, the sea ice was so thick that it became impervious to winds. However, in the last few years, without the iceberg, the winds chipped away and finally this year, ka-wham! Open water all the way to Scott Base. I’m sure the Weddell seals that had been congregating, safely over there, woke up one morning staring at killer whales. However, even more dramatic, the McMurdo Ice Shelf (MIS), which flowed out between White and Black Islands to cover southern McMurdo Sound, also broke out!!! A chunk several kilometres wide floated away. This almost annihilated the blue ice runway, that is key to the logistics of the US and NZ Antarctic programmes. In the end it didn’t break out quite that far south, however, to take the runway with it. Even more important, at least from the science standpoint, when the MIS portion went away, so did the fast (sea) ice that lies along the Victoria Land coast, opposite from Ross Island, from the MIS north to the Drygalski Ice Tongue. As far as anyone knows, this is the first time that this has happened in 4000 years!!!! Before then, for a period of several hundred years, and with no fast ice along that coast, Adélie penguins bred at several colonies such as at Marble Point. We know this from the carbon dating of bones and egg shells left in these extinct colonies. Given these new circumstances it is now possible, if the MIS growing outward gets extensive enough to again lock in the fast ice... then Adélie penguins may re-colonise this coast. Stay tuned!!! This season also showed continued growth of the already immense Adélie penguin colony at Cape Crozier. We don’t yet know for certain (need to count aerial photos) but that colony should now be about 230,000 pairs, thus passing out a few other colonies to go from sixth largest to almost the largest in the world for this species. Why the sudden spurt in growth over the past few years, we don’t know for sure. However, not seeing any climate factor, I suspect the apparent decrease in Antarctic toothfish may be playing a role. Both toothfish and penguins favour Antarctic silverfish in their diet; fewer toothfish means more silverfish (‘herring of the Antarctic’) making life easier for the penguins (higher breeding success, higher survival). Consistent with more silverfish has been an increase in the prevalence of emperor penguins seen along the fast ice edge of McMurdo Sound during the past few years. Formerly one could expect to see a few dozen, but now there are hundreds. Also consistent with fewer toothfish, is the continuing decrease in the prevalence of Ross Sea killer whales. Toothfish researchers Clive Evans (NZ) and Art DeVries (USA) caught only seven individuals in more than a month of fishing. Ten years ago, they’d expect to catch hundreds. The Ross Sea is changing, that’s for sure, owing to forces of nature as well as to humans. We have a petition running on our new homepage. We are lobbying the New Zealand Government to change their stance on commercial fishing activities in the Ross Sea. It only takes a minute to sign and we will be presenting the signatures to the Government next year. The success of this depends on spreading the word... PLEASE share the link with your friends and colleagues! The Last Ocean Charitable Trust consists of a small team of passionate people. For the next few months we will be bringing you a short profile to introduce you to the faces behind the Last Ocean. First up is Kate Beer, our new part-time coordinator (and newsletter editor) who is based in the Christchurch office. Kate joined the Last Ocean team in February 2011 after completing the Postgraduate Certificate in Antarctic Studies at the University of Canterbury. She has previously worked as a graduate ecologist, having also obtained a Bachelor of Science (Zoology), and Postgraduate Diploma (Wildlife Management) from the University of Otago. It was during her time at Otago that Kate was introduced to the beauty of the Southern Ocean, taking part in the first ever distribution survey of yellow-eyed penguins at the sub-Antarctic Auckland Islands. This expedition was a 27-day adventure, working and living aboard the 50-ft research yacht RV Tiama. Kate’s more recent studies have taken her to Ross Island, Antarctica where she visited McMurdo and Scott Base and spent time camping at Windless Bight on the Ross Ice Shelf. 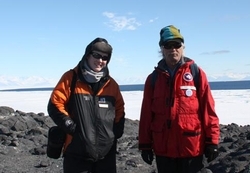 On an excursion to Cape Royds she met David Ainley and saw the Adélie penguins that call the Ross Sea home. Through these experiences Kate has developed a real fascination for the Southern Ocean and raising awareness about the threats that exist in this special part of the world. Working for the Last Ocean Charitable Trust combines her passions for marine ecology, conservation advocacy and science communication. Did you know Emperor penguins are the deepest diving birds in the world? They have been recorded taking plunges of nearly 600m! The Ross Sea region is home to 26% of the world Emperor Penguin population. These magnificent birds can reach 120cm in height and weigh up to 40kg. Incredibly, Emperors breed on the open ice during the harsh Antarctic winter. Females lay a single egg which is incubated by her partner. Once hatched, the both parents care for the chick, taking turns to trek up to 100km to the ice-edge in order to forage. The Last Ocean Charitable Trust relies completely on donations to keep up our campaign for the protection of the Ross Sea. If you feel our work is important, you can help keep us on track by making a secure donation online here. Thanks for taking the time to read our newsletter. Please forward it on to your friends and family, and don’t forget to check out our new digs at www.lastocean.co.nz.